In Montenegro media ownership is formally transparent, yet there is no central, publicly available register that contains all the information regarding media outlets and their ownership structures. Although, officially, there is no concentration of media ownership, the vast majority of media outlets are ultimately controlled by a few individuals (two, tree at the most), some of whom are primarily engaged in other businesses. Such is the case of the Greek businessman Petros Stathis, founder of the company First Financial Holdings(FFH) and one of the most important private partners of the Montenegrin government. According to the records in the Central Registry of Business Entities , kept by the Revenue Agency, First Financial Holdings’ main activity is "fruit and vegetable trade". However, the company appears in the Register also as a founder of two other firms owning 4 media outlets: two newspapers and two online portals. Therefore, First Financial Holding controls, through the firm Media Nea the outlets Dnevne novine , Pobjed a and the web page CdM . The same FFH controls 100% of Portal Press, founder of the online news portal Analitika . On transparency and concentration of media ownership in Montenegro, we created a series of entries on Wikipedia, as part of our Wiki4Mediafreedom activities: read the articles about "Media of Montenegro" and the section on "Concentration of Media Ownership " on Wikipedia. These entries are also available in the Resource Centre for Freedom of the Press. First Financial Holdings holds 99,99% of the share capital of Media Nea. The remaining 0,01% of the share capital of Media Nea is owned by Boris Darmanović, who, according to the Register, is company’s founder and executive director, as well as the managing director of Dnevne Novine and Cdm. As far as the newspaper Pobjeda is concerned, its director and authorized representative is Draško Đuranović, whose name appears in the Register also in reference to Portal Press, the second media company controlled by Stathis’ First Financial Holdings. Portal Press owns the news portal Analitika, and while the company’s authorized representative is the above mentioned Draško Đuranović, it’s executive director is the latter’s wife, Tinka Đuranović. Behind all of the above-named media outlets, two newspapers and two information portals, stands Petros Stathis, one of the major private partners of the Montenegrin government. Besides being the founder of First Financial Holdings, Stathis also owns the company Monte Rock, through which he manages, as owner or lessee, four hotels and seven beach resorts situated along the Montenegrin coast between Sveti Stefan and Pržno. His partnership with the government caused a rupture of the long-standing alliance between political parties DPS and SDP, which happened last year when SDP, unwilling to support the conclusion of certain concession agreements considered unfavorable to the State, decided to step out of the governing coalition. In Montenegro, the question of media concentration is regulated by the Law on Electronic Media. According to this Law, however, there is nothing problematic in cases such as the one described above, where the control over a certain number of media outlets -that occupy a large part of national media space and have a pro-government editorial policy - is concentrated in the hands of one single person. The Law on Electronic Media prescribes that an owner of a print media cannot hold more than 10% of the share capital of an electronic media, and vice versa. Furthermore, the same juridical person cannot simultaneously be the owner of two electronic media. The same legislation also prohibits first and second-degree relatives of an owner of print or electronic media from holding shares in another electronic media. The documents dealing with this subject point out that setting limits on media concentration is necessary in order to ensure media pluralism, considered a fundamental precondition for a democratic society, an aspect which is constantly emphasized also in the progress reports of the European Commission. The independent report Media Clientelism Index 2016, published within the framework of the project entitled “MEDIA CIRCLE”, states that “media pluralism is protected primarily by limiting concentrations of media”, understood as “a market shift in which the number of media outlets, or rather of those who, directly or indirectly, control them, is reduced”. The document also indicates that there exist two types of media concentration: horizontal and vertical. A horizontal concentration relates to controlling several media outlets of the same type that under normal circumstances would be mutually competitive, as well as to the ownership of several media outlets of different kinds by a company whose primary activity does not fall into the media sector. A vertical concentration, on the other hand, implies control over the entire process of production and distribution of media content, as well as control over several media outlets of the same type operating at different territorial levels. The survey was conducted in six countries of South East Europe, including Montenegro. As stated in the section dedicated to Montenegro, the media outlets are founded through a “foundation act”, freely and without the need for any prior authorization. All media are obliged to request registration in the Media Register, for which it is sufficient to provide information relating to the company name and the address of the head office. Regarding electronic media, the legislator has imposed more precise measures, aimed at regulating the transparency of ownership and prohibiting concentration of media. Pursuant to Article 129 of the Law on Electronic Media, media service providers are obliged to submit to the Agency for Electronic Media, not later than 31 December of the current year, information on natural and juridical persons who during that year have held, directly or indirectly, a percentage of the share capital. The Agency is then obliged to publish the gathered data in the Official Gazette of the Republic of Montenegro. In addition, the Agency keeps a public register of licenses issued for providing audiovisual media services, as well as a register of electronic publications. As prescribed by the law on electronic media, media concentration is considered illegal when an operator holding a national broadcasting license holds more than 25% of the share capital or voting rights of another broadcaster with the same license; or when it holds more than 10% of the share capital of a news agency or a newspaper whose daily circulation exceeds 3.000 copies, and vice versa. The same logic applies to media outlets operating at the local and regional level. What emerges from the above is a rather sketchy legislative framework which, allowing excessive fragmentation of ownership rights, transferring shares to family members, etc., resulted in a situation where, officially, norm violations never occur and, as a consequence, no sanctions are being pronounced. So the fact that Petros Stathis, an entrepreneur closely related to the governing party, owns several national media outlets is not problematic because the legislator didn’t even take into account such hypothesis. When asked about when and how this legislative gap will be bridged, the representative of the Ministry of Culture explained that the Agency for Electronic Media is responsible for carrying out the relevant law, which, however, has been recently amended, so there are no signs of it happening again in the near future. In his written response to questions asked to him by Vijesti, Željko Rutović, head of the Directorate for Media under the Ministry of Culture, recalled that in July 2016 the Montenegrin parliament approved amendments and supplements to those parts of the law on electronic media that had to be adjusted to European standards, in accordance with the requirements arising from the accession negotiations. “The government’s agenda for 2017 does not envisage any further amendments to this law. In 2010, during the law drafting process, the formulation of regulations relating to media concentration has been closely monitored by experts and competent Directorates-General of the European Commission, in accordance with procedures and obligations related to harmonization with EU legislation”. In one of its annual progress reports on Montenegro, the Commission acknowledged that the law on electronic media “provides a solid base for development and normal functioning of public media service providers and, more generally, for achieving a higher level of media independence and professionalism”, concluding that in this field “has been achieved a good level of legislative alignment”. The co-owner of Media Nea, Boris Darmanović, was not willing to discuss this matter, ignoring calls and messages from Vijesti. 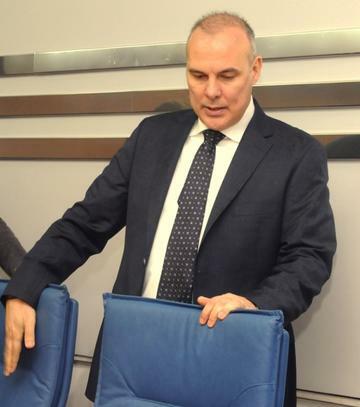 Likewise, Draško Đuranović, authorized representative of Portal Press and editor-in-chief of Nova Pobjeda, refused to make any statement on the matter. The Agency for Electronic Media (AEM), as regulatory authority competent to deal with this matter, whose director is Abaz Džafić, affirms that as far as the Montenegrin audiovisual media market is concerned “in the last five years, only two sanctions relating to ownership concentration have been imposed”. Both media outlets sanctioned are known for their critical stance towards the government. An excessive degree of ownership concentration was evidenced only in the case of TV Vijesti, whose owners also own the company Daily Press, founder of the daily newspaper Vijesti, and in the case of M.D. Company (Radio D, D+), whose owners control Jumedia Mont, founder of the newspaper Dan. Daily Press is the founder of the daily Vijesti and Vijesti Online, and its owners are Styria Media International and Media development investment fund, as well as Željko Ivanović, Katarina Perović and Ljubiša Mitrović. 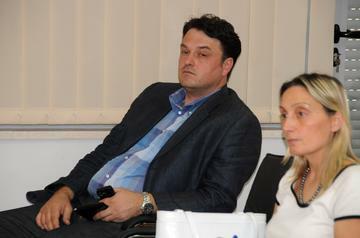 The founders of TV Vijesti are Matijaž Popović, Slaviša Šćekić, Bojica Bošković and Milka Tadić Mijović, while among the members of the Board of Directors are two of the founders of the daily Vijesti, Ivanović and Mitrović, as well as Miodrag Perović, whose cousin Katarina Perović is one of the owners of the daily Vijesti. As far as the daily Dan is concerned, its founder is the company Jumedia Mont, whose owners are Mladen Milutinović and Slavica Jovanović, as well as the latter’s underage son. Radio stations D and D+ were founded by M.D.Company, whose 50/50 co-owners are Dejan Ražnatović and Ljiljana Martinović, while the above-named Milutinović is its authorized representative. Milutinović claims that they had done everything “in accordance with law and with requirements imposed by regulatory authorities”. Nevertheless, he has been obliged to sell his share in the above-mentioned radio stations, even though they broadcast exclusively music. On the other hand, the Agency for Electronic Media does not seem to be concerned about the fact that Petros Stathis owns four all-news media. “It is obvious that more attention is being paid to formal aspects of media concentration than to those elements which are truly fundamental. Because it is the government who, by exercising its influence over certain individuals, has a real monopoly over information”, says Milutinović. The Montenegrin Competition Agency (AZZK), whose main task is to prevent excessive market concentration, has never sanctioned any media company for such contravention. “The Agency is not aware of the existence of any illegal concentration in that field. So far, the Agency has not rejected any ‘request for increasing media concentration’, or rather it did not prohibit any merger. From its foundation, the Agency has received and approved 16 requests to obtain authorization for merger in the media sector, 11 of which extraterritorial and 5 national”, stated the Agency, headed by Miodrag Vujović, in its written response to Vijesti. Does the rule fit the size? Although their primary goal should be to prevent the formation of monopolies, provisions related to media concentration are only increasing the opacity of media ownership. 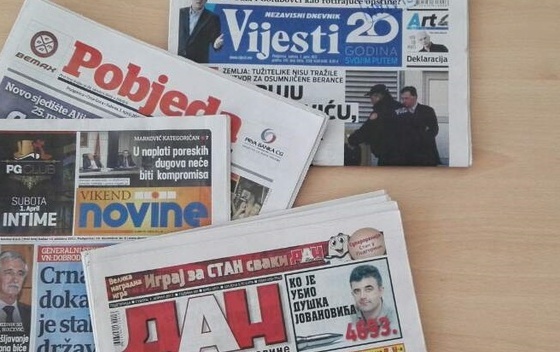 Željko Ivanović, one of the owners of Daily Press, considers that, in a small media market such as Montenegrin, regulating concentration does not make any sense. “In a small country such as Montenegro, with even smaller media market – over the course of decades systematically destroyed by unfair competition and strong alliance between the Serbian media and advertising agencies, on one side, and the Montenegrin government and regulatory authorities, on the other – yet another normative restriction has been introduced related to concentration of media ownership. As if we were, at very least, Great Britain or Italy”, laments Ivanović. In his opinion, in order to regulate a small media market such as the Montenegrin one, it would be sufficient to apply the law on protection of competition, aimed at preventing the formation of monopolies of any kind, including in the field of media. “And yet, in order to show off the alleged dedication of Džafic and Vujović (directors of two competent regulatory agencies) to European standards, a whole new set of measures has been introduced, related to media concentration, which however, because of being adequate only for big countries, with rich markets, ended up producing a counter-effect: instead of strengthening transparency of media ownership, the new regulation is making real owners even more invisible”, explains Ivanović. The country’s largest media outlet is the national public service broadcaster, consisting of TV station (TVCG), radio (RCG) and information portal (RTCG). The biggest commercial TV stations are Pink M, belonging to Pink Internation Company owned by Željko Mitrović, and Prva TV controlled by Antenna Group, whose owner is Greek businessman Theodore Kyriakou. Both these broadcasters are “imported” from Serbia and are considered to be excessively pro-government. Among the media outlets with national coverage should be mentioned Radio Antena M and the weekly newspaper Monitor. Monitor shares the same fate as most of the media that ended up with limited room for manoeuvre because of economic pressures exercised by the government. However, its role as pioneer of investigative journalism in Montenegro is indisputable. The founders of Monitor are Željko Ivanović, Miro Perović, Vladimir Nikaljević, Aleksandra Popović and a group of journalists who still form the newsroom’s core: Milka Tadić Mijović, Miodrag Rašović, Zoran Radulović, Predrag Nikolić and Esad Kočan. Ivanović and Perović are also linked to TV Vjesti and the daily Vijesti, while the latter and his cousin Miro are among the founders of Radio Antena M.
Once considered to be an independent broadcaster, this radio station recently adopted a pro-government editorial policy. According to the Central Registry of Business Entities, among the founders of Radio Antena M are Darko Šuković, who currently holds the position of managing director and editor-in-chief, Vladimir Nikaljević and Miodrag Radojčić. Željko Ivanović also draws attention to the case of Finland, considered as one of the European countries with the best regulatory environment as far as the media sector is concerned, where the risks of violation of freedom of expression and information, as well as the risks of erosion of professional standards, are extremely low. As pointed out in a survey which examines the state of media pluralism in Europe, published by the Centre for Media Pluralism and Media Freedom (CMPF), Finland does not have any specific regulation on media concentration, so the phenomenon of cross-media ownership is very widespread. In fact, the eight largest companies control as much as 98% of country’s media market, and yet neither of them holds monopoly. “The Finnish media system is highly concentrated, although much of this can be explained by the small market size. For this reason, stricter anti-concentration regulation cannot be recommended”, states the report of CMPF. Agron Bajrami, editor-in-chief of the leading Pristina daily newspaper Koha Ditore, says that in Kosovo the situation is similar, since the country has an antitrust law but there is no specific regulation on media concentration. According to him, that is a good normative solution, especially considering the mushrooming of new media. “In Kosovo there is no specific regulation concerning ownership concentration. There is only an antitrust law that prohibits the formation of monopolies. I think it makes a lot of sense, especially nowadays with all these new media – web portals, cable TV, social media…I don’t know how things are in the European Union, but laws and regulations pertaining to media concentration, as far as I understand, belong to the past. As long as there is a law that prohibits the creation of monopoly, I think that is enough”, concludes Bajrami. According to data from the Agency for Electronic Communications and Postal Services (EKIP), the percentage of Internet users in Montenegro, in 2015, was 18,1% of the total population, the percentage of households with Internet access was 57,7%, while the percentage of those with cable TV reached 84,27%. These data confirm the fact that new media are taking primacy over traditional ones. In September 2017, the new Law on Electronic Media in Montenegro will enter into force. Web portals are also considered in this new regulation. The question is whether that will be enough to convince the competent regulatory authorities to change their mind regarding the legitimacy of media concentration in the case of Petros Stathis, owner of two newspapers and two web portals. Is Stathis the real owner? Ivanović consider suspicious that the media owned by the controversial Greek businessman never host any advertisement promoting his companies operating in Montenegro. A consideration that raises some doubts on whether he is the real owner of these media. “For years now, media which are directly serving the personal and political interests of the former Montenegrin Prime Minister are directly owned by people connected to him: his godfathers, various tycoons and controversial foreign investors. In such a context, it is a paradox that in the media owned by Greek businessman Stathis, none of his companies operating in Montenegro has ever been advertised, while the quasi totality of advertising space is occupied by Bemax. This raises another question: why would a company entrusted with asphalting and construction projects all over the country, thus enjoying a de facto monopoly position, need to promote itself in any media? In fact, it only does it in the allegedly ‘Greek’ ones. So one might well wonder whether Petros Stathis is the real owner of these media or just a ‘trade-mark’? This is a blatant example of how senseless the regulation on media concentration is, and how easy it is to be circumvented, at the same time justifying its introduction with the alleged respect of European norms”, concludes Ivanović. According to the Agency for Electronic Communications, in 2016 in Montenegro have been registered 16 television broadcasters (4 with national coverage, 9 regional and 2 local) and 37 radio broadcasters (5 with national coverage, 8 regional and 24 local).